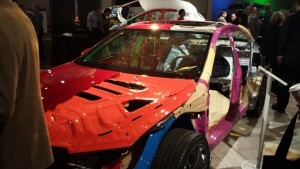 Automotive closures — doors, hoods, and tailgates — should be 44 percent aluminum by 2025, an expert on the metal predicted at SEMA. 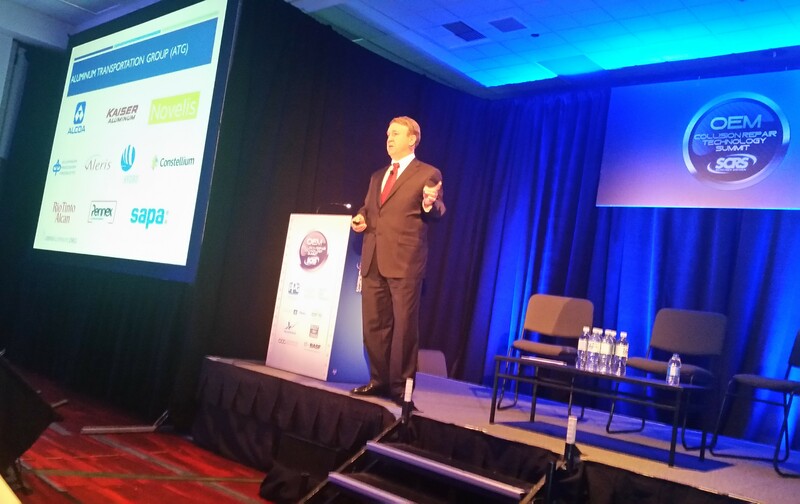 “The big growth’ll be in closures, by the way,” Kaiser Aluminum engineering and technology Vice President Doug Richman told the audience at the SCRS OEM Collision Repair Technology Summit. “This isn’t taking over your business,” he said. 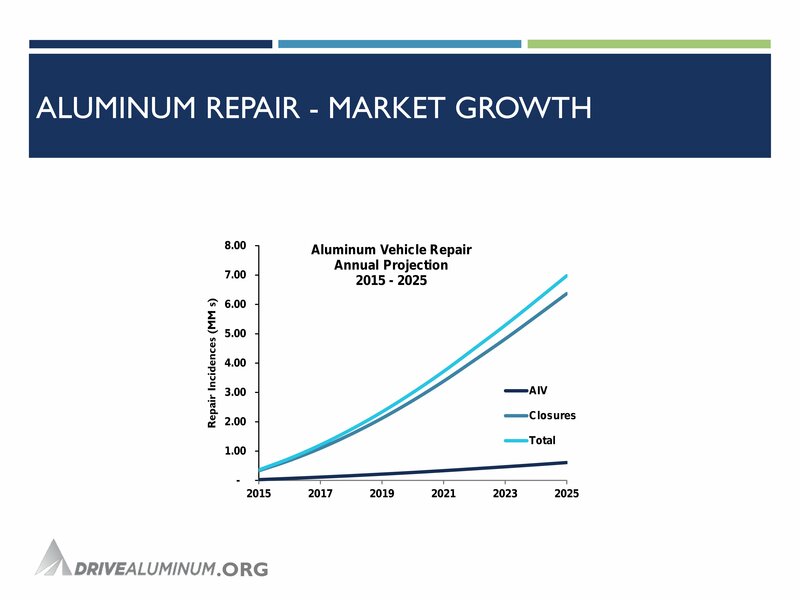 Aluminum averages 394 pounds per vehicle, according to Richman, citing Ducker Worldwide statistics. About 73 percent of that weight is castings, 33 percent is engine-related and 11 percent body- and closure-related. 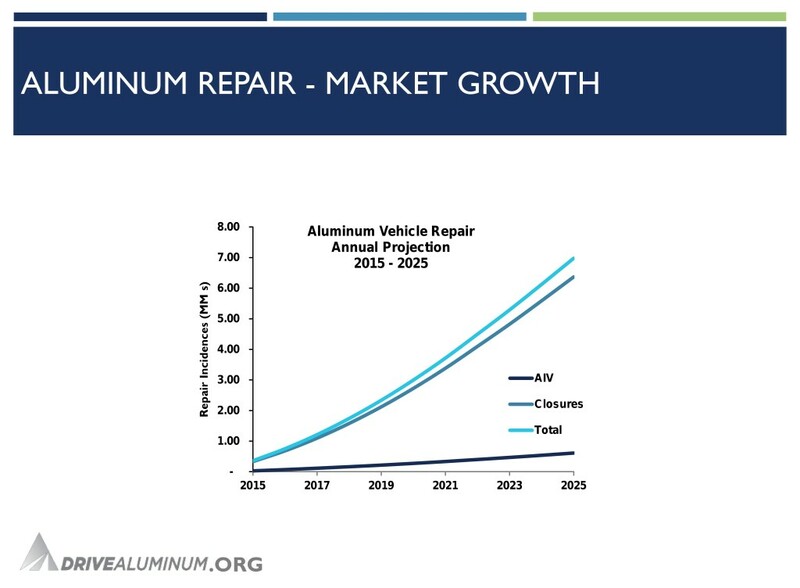 He projected aluminum automotive closure repairs would rise from a couple hundred thousand incidences this year to more than 6 million by 2025. Abey Abraham of Ducker Worldwide gave a similar assessment at Great Designs in Steel in May. Steel would still win the battle for the entire car, but some of its turf will be lost to aluminum — including at least one closure. Only 22.3 percent of hoods were aluminum in 2009, according to Abraham. This year, OEMs used the metal on 48 percent. By 2025, 80 percent of hoods will be aluminum. Paintless dent repairers, take note. 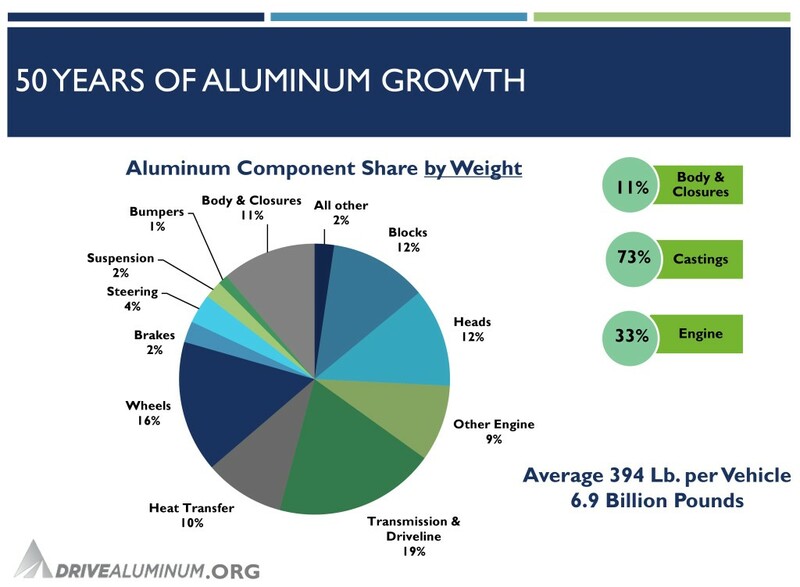 Aluminum also grew from being completely absent from side and trunk doors in 2013 to making up around 6 percent of them, according to Abraham. (See his data here.) That supports Richman’s arguments, too. Engines might actually level off or shrink in terms of total aluminum, according to Richman, as it and other lighter, stronger materials throughout the rest of the car allow smaller powertrains — saving more weight again. Richman called this sort of effect a secondary mass reduction. A pound of weight saved on the body typically lets the OEM cut about half a pound out of something else on the car, he said. He predicted aluminum itself’s “market share” on the average vehicle would grow from 10 percent to 13 percent between 2015 and 2025. However, the average vehicle itself would only weigh 3,427 pounds, down from 3,700 pounds. By 2025, he predicted, aluminum would account for 500 pounds of the average vehicle, citing Ducker Worldwide projections. Besides providing a nice, forecastable 10-year date, 2025 matters to the auto body and automotive industries for a federal mandate to hit 54.5 mpg by then. Technically, Richman noted, the government set a carbon dioxide target, not a fuel economy one. OEMs are projected to need to hit 54.5 mpg to produce the reduction in emissions the feds want. The result is the same, he said: Cars have to get lighter. “I sell weight reduction. I don’t sell aluminum,” he said. 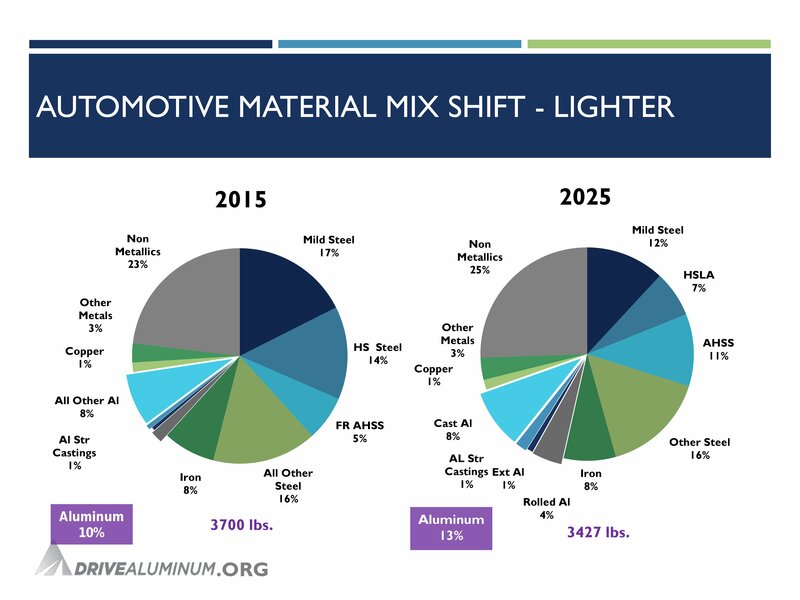 This year saw the highest growth spurt in automotive aluminum both nationally and the world, according to Richman. Typically, a pound of aluminum can replace 1.7 pounds of mild, high-strength, or advanced high-strength-steel, according to Richman. 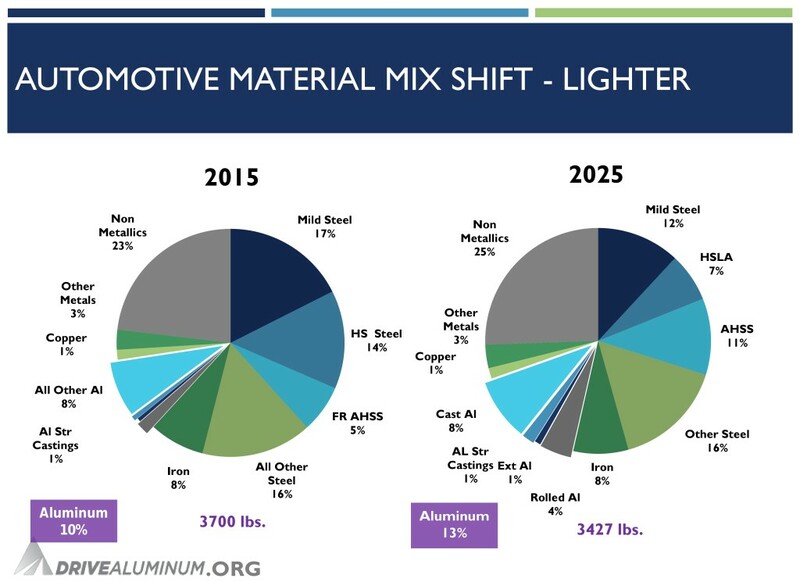 Correction: Though Richman initially estimated 30 percent of closures would be aluminum by 2025, he later gave a 44 percent projection. The article has since been updated.